Anchovies are one of the most overlooked baits when it comes to catching rainbows, browns, and King salmon in lakes and reservoirs. When properly prepared whole or filleted anchovies catch fish. Anchovies are rich with fish attracting oils and leave an awesome scent trail in the water when trolled and attached as an additional attraction to a number of baits. The greasy baitfish can most often be found at any bait shop or tackle store. They are most often sold frozen and can be bought in bulk bags or by the tray. Meanwhile, anchovies are a soft bait. Brining them is imperative. I use Natural Fire Brine because its easy to use, enhances the toughness of the bait, makes it more durable, extends the bait’s longevity and makes the scales shine, all things that important when trolling the anchovies whole. Blue or Chartreuse Fire Brine might be the best color for you, but I prefer Natural Fire Brine. Experiment with the colors on your own. Brining baits couldn’t be easier. I’d like to be able to say I have a secret Fire Brine recipe that I’m going to reveal to the fishing world, but the truth is Pautzke has already developed the perfect brine. All you have to do is open a bottle of Fire Brine and pour enough to cover the anchovies. It’s simple and saves me the trouble of making a homemade inferior brine recipe like we used in the old days. Remove frozen anchovies that are to be brined and place in a plastic bag or container with a lid that seals tight. Pour enough Fire Brine into the bag/container to cover the anchovies. I prefer to stir the brine to make sure baits are completely submerged. Place container in fridge overnight. Special Note: When I need the baits to firm up quickly I add a liberal coat of non-iodized salt to the brine. This speeds up the firming process. After an overnight soak drain the Fire Brine from the baggie or plastic container. If I’m running anchovies in bait heads I’ll leave them whole. However, if I plan to use them as part of a presentation as a strip on a streamer fly or on a hoochie rig, I’ll fillet the anchovies. It’s best to cut the meat into thin strips that trail the presentations without interfering with their action. A little goes a long way in the case of fishing for trout or landlocked salmon. Big chunks aren’t necessary to get bites. I’ll often run the strips 1/8 to 3/16 of an inch wide on a one-inch strip or a ¼ inch by ¼ inch chunk to put on a double hook rig with a hoochie skirt. 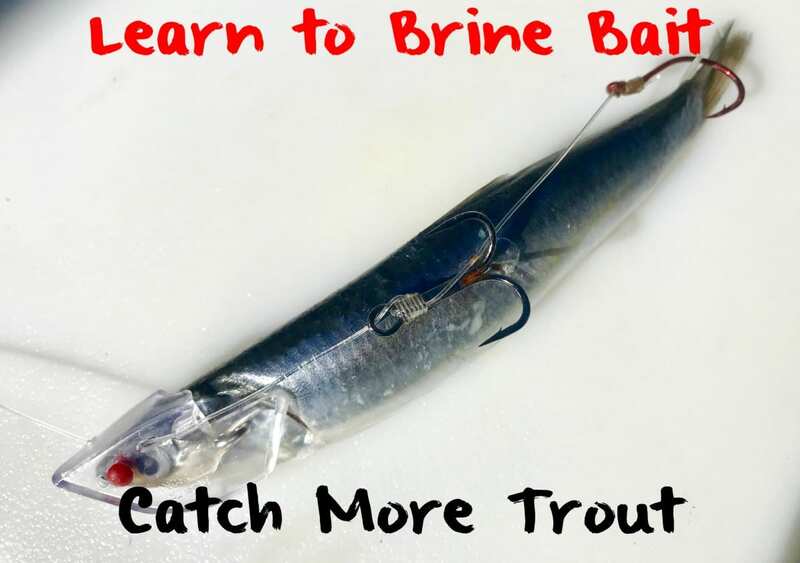 Brining anchovies, herring and other baitfish is this easy. However, it’s important to keep the bait cool. Keep it in a cooler while on the water and return the container to the fridge after fishing. If you keep it cold you can use the bait or bait strips for several days. If you aren’t fishing for several days freeze them. When you thaw them they will fish fine.